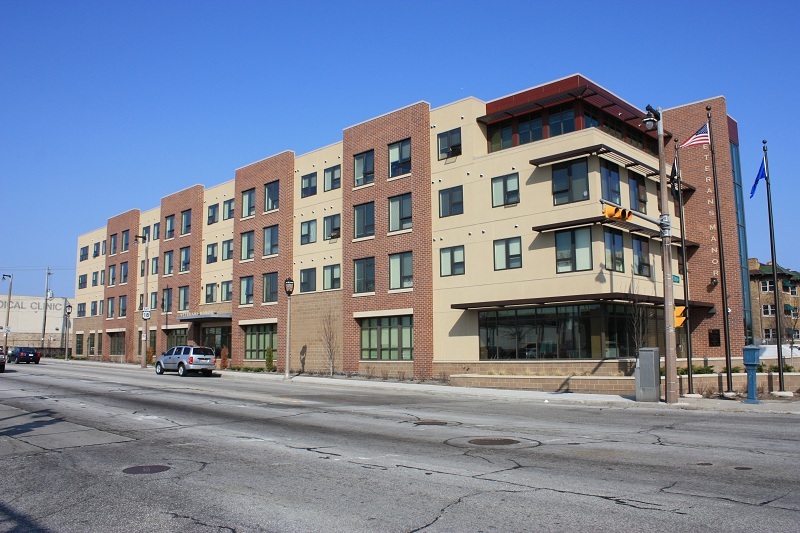 A mixed-use, affordable housing development that provides 52 permanent supportive housing units to veterans recently opened in the heart of the Near West Side in Milwaukee, Wisconsin. The Thomas H. Wynn, Sr. Memorial Veterans Manor officially opened its doors on Memorial Day 2011 and is now home to many formerly homeless veterans. Built in a prominent location along important transportation corridors with convenient access to downtown and a major freeway, the development is helping to revitalize the Near West Side. 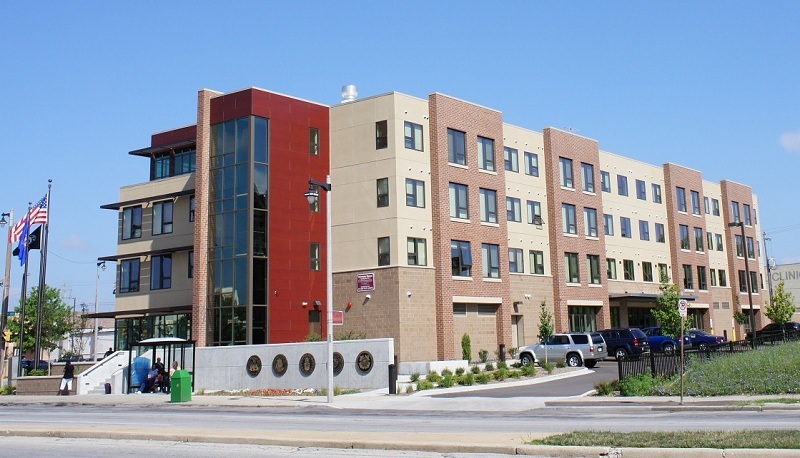 Veterans Manor, a modern, four-story building, received three housing awards in 2012: the Mayor’s Design Award, a Partnership Fair Housing Award from the Wisconsin Fair Housing Network, and a Milwaukee Award for Neighborhood Development Innovation from Local Initiatives Support Corporation (LISC) Milwaukee. In 2004, the Near West Side Area Comprehensive Plan identified eight catalytic projects to spur investment in the neighborhood.3 The Veterans Manor parcel is located within the boundaries of two of them. One, the 35th Street Area Redevelopment project, had the potential to attract high-quality commercial and retail uses because of the amount of vacant and underutilized land within its boundaries. The other, the Wisconsin Avenue Enhanced Transit Opportunities/Amenities project, had access to transit that the city could readily improve. 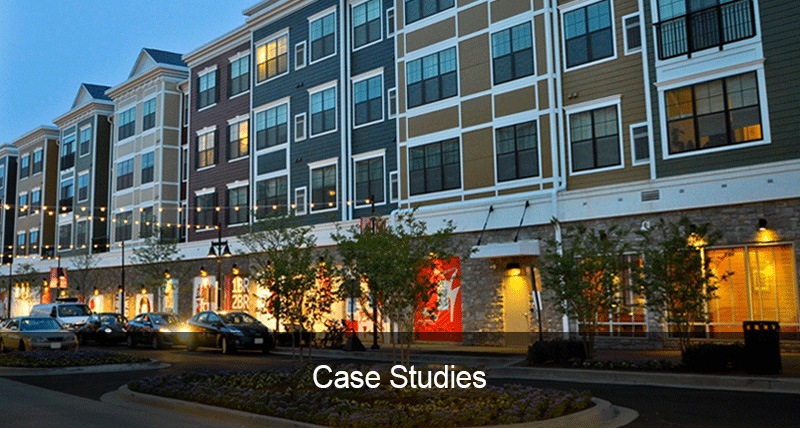 To maintain the neighborhood’s character, the plan incorporated higher density multifamily residences and mixed-use, transit-oriented developments in these catalytic projects. 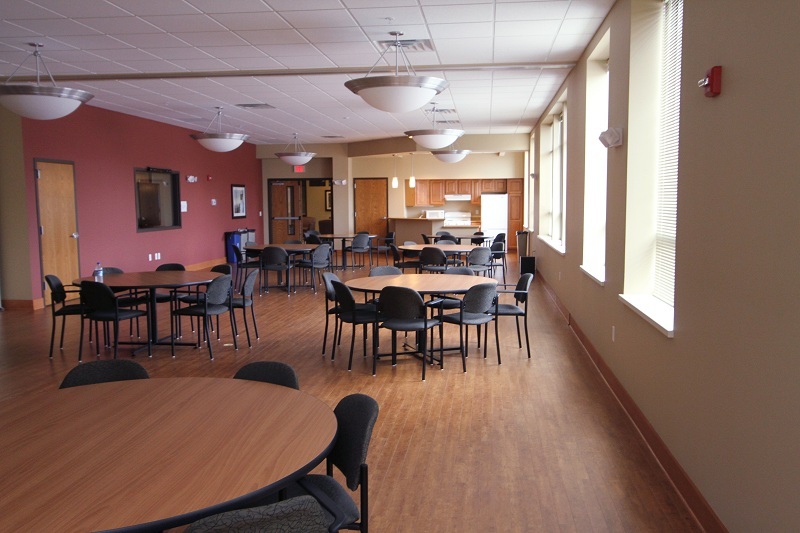 Veterans Manor’s prominent Near West Side location demanded a high-quality design. 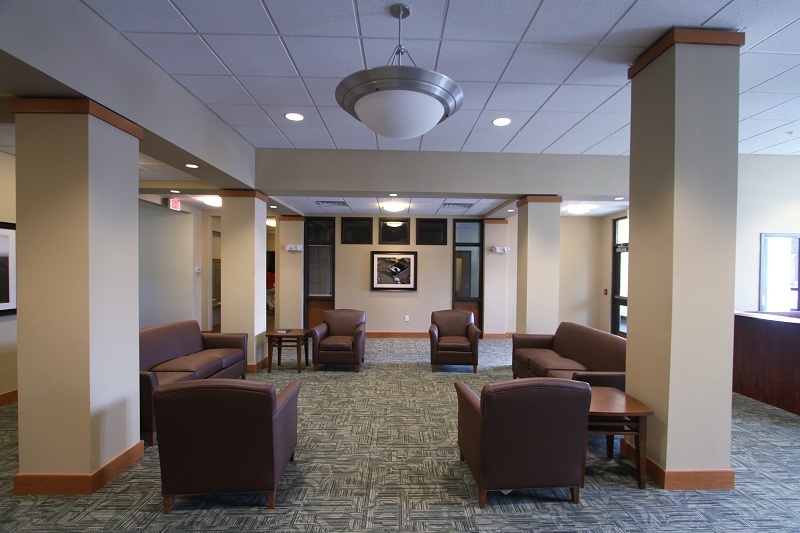 The design team, led by Eppstein Uhen Architects, envisioned a building that not only met these aesthetic demands but also incorporated the special functions of supportive housing for veterans: space for the supportive services and common areas for social and communal interaction. At 62,259 square feet, Veterans Manor is a narrow rectangular structure fronting on Wisconsin Avenue.8 The front of the building is anchored by a red brick wall bearing the building’s name. The brick wall separates a façade of large windows with sunscreens to help control glare and building temperature from a glass-fronted stairwell that is illuminated at night. The building is set back from the street, but centrally located entry steps meet the sidewalk in front. On the west side of the entry steps is a landscaped wall with flagpoles that suspend the Wisconsin, United States, and Prisoner of War flags. 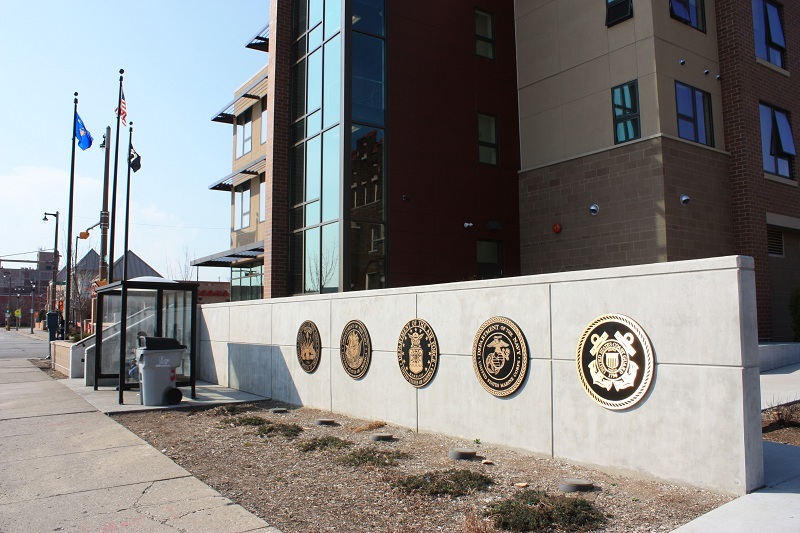 On the entryway’s east side is a decorative wall with five large medallions representing the five branches of the military. The 35th Avenue façade features an alternating pattern of light beige and red brick. Near the center of the façade is an entrance to the northern half of the first floor, a 5,635-square-foot commercial space that includes an independently operated commercial kitchen and space for a deli or café. The southern half of the first floor contains space for supportive services, including offices for CVI and case managers and a nurse practitioner’s station, as well as a community room with a big-screen television, fitness room, and business lab. 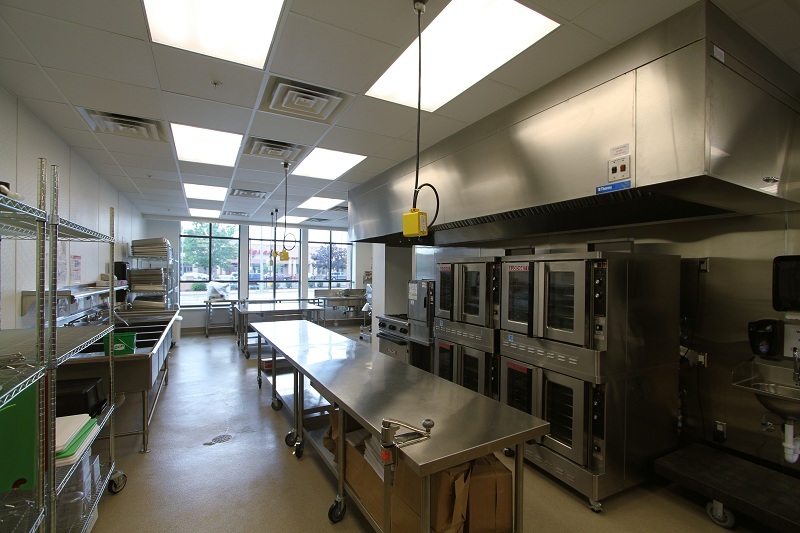 Residents also benefit from local amenities, including the nearby 35th Street commercial district and a bus stop directly in front of the building that provides easy access to Wisconsin Avenue and downtown. On a single night in January 2011, 1,466 people were homeless in Milwaukee. Of these, 192 people (13%) were veterans, including 15 who were unsheltered or living in a place not intended for human habitation.18 Veterans Manor is helping to end homelessness for some of those veterans. 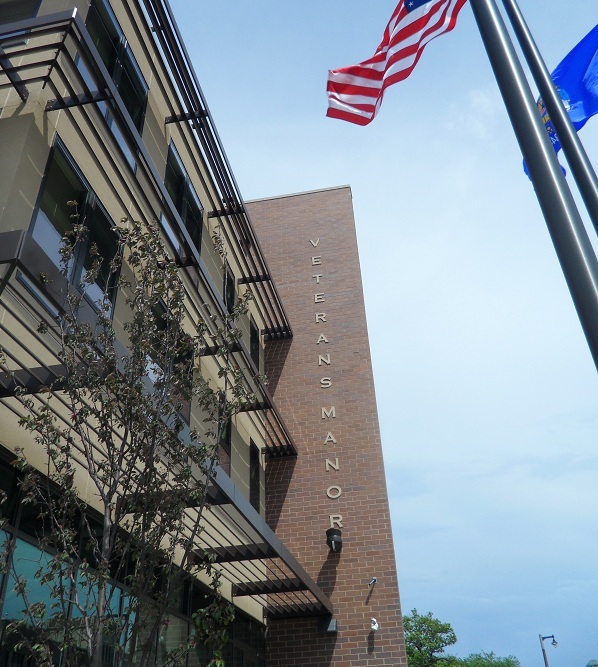 The government and cross-sector coordination that helped fund Veterans Manor has resulted in a permanent supportive housing community for 52 low-income veterans, many of whom were formerly homeless. From the city’s perspective, development activity in the Near West Side community during a slow growth period has been a significant benefit to the economy, and a lot that had been vacant for years is now generating tax revenue.20 The project’s high-quality design at a prominent location is expected to stimulate similar development activity. Veterans Manor provides researchers and policymakers with a valuable lesson in how to use partnerships to finance, design, and build high-quality, low-income housing that can be a catalyst for community revitalization. To learn more about HUD’s efforts to eliminate veteran homelessness by 2015, read the summer 2012 issue of Evidence Matters. Milwaukee Department of City Development. 2004. “Near West Side Area Comprehensive Plan,” 63–67. Suzanne Hanson, operations manager, Milwaukee Development Center, Department of Community Development, e-mail correspondence, 19 September 2012. Erich Schwenker, president, Cardinal Capital Management, telephone interview, 3 July 2012. Ibid. ; “Milwaukee’s Veterans Manor: Permanent Supportive Housing and Services for Veterans,” Tax Credit Advisor, 26 September 2010. Accessed 25 June 2012. Robert Cocroft, president and chief executive officer, Center for Veterans Issues, telephone interview, 28 June 2012. Milwaukee Development Center. April 2011. “Application for Certificate of Occupancy,” document provided to HUD. Veterans Manor, Construction, “They Thought of Everything!” Accessed 29 October 2012. George Galster, Kathryn Pettit, Peter A. Tatian, Anna M. Santiago, Sandra J. Newman. 1999. “The Impacts of Supportive Housing on Neighborhoods and Neighbors.” Washington, DC: U.S. Department of Housing and Urban Development, Office of Policy Development and Research, xiv. Yin-Ling Irene Wong, Trevor R. Hadley, Dennis P. Culhane, Steve R. Poulin, Morris R. Davis, Brian A. Cirksey, James L. Brown. 2006. “Predicting Staying in or Leaving Permanent Supportive Housing That Serves Homeless People With Serious Mental Illness.” Washington, DC: U.S. Department of Housing and Urban Development, Office of Policy Development and Research, ii. Cardinal Capital Management, “About Cardinal Capital Management: Cardinal Capital News.” Accessed 25 June 2012. Jack Reichl, vice president, Reichl Construction Inc., internal memo provided to HUD, 25 July 2012. Megan Kocchi, marketing specialist, Eppstein Uhen Architects, e-mail correspondence, 3 July 2012. Vanessa Koster, planning manager, Milwaukee Department of Community Development, e-mail correspondence, 27 June 2012.